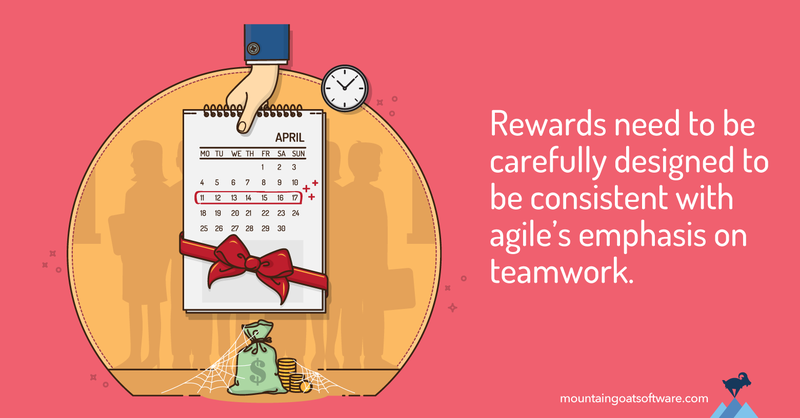 There's a role for rewards on agile teams, but they need to be carefully designed. Done well, rewarding team members with incentives and bonuses can benefit everyone. I’ve been working with a company to revamp their bonus and incentive structure as part of the organization’s desire to become Agile. No matter how well designed and executed an agile transition is, if incentives remain in place that encourage non-agile behavior, that’s how people will behave. In “Succeeding with Agile,” I referred to this as organizational gravity. Unless enough of an organization’s culture is changed in becoming Agile, organizational gravity pulls the organization right back to where it started. Improperly aligned bonuses and incentives are some of the biggest sources of organizational gravity. Before looking at how we can create proper bonuses and incentives, let me clarify the difference between a bonus and an incentive. An incentive is a reward given to an individual or team for achieving a stated goal. An incentive is offered in advance and is meant to motivate behavior in predictable ways. When my youngest daughter was little, I told her that if she cleaned her room by 3:00 p.m., I would take her to see a movie. That was an incentive. In contrast, a bonus is not stated in advance. Rather, it is announced and given at the time something is accomplished. Again using my youngest daughter as an example, when she came home from school with a great grade on a test I knew she’d studied hard for, I told her we’d celebrate that accomplishment by getting ice cream. That was a bonus. Incentives and bonuses are both rewards with the key difference being that an incentive is announced in advance whereas a bonus is announced on the spot. Bonuses and incentives can work against the goals of Agile. For example, rewards that single out individual performers discourage teamwork. I’ve seen these in the form of “Programmer of the Year,” “Team Member of the Month,” “Most Valuable Contributor,” and more. Other types of rewards encourage the sub-optimizing of behavior. Many of us have stories about testers who were rewarded based on the number of bugs they found. This type of reward led one tester I met to log over 200 entries into the defect tracking system for a single bug. The bug was simply that a value was being improperly calculated and displayed on the screen. However, the product ran on four operating systems (the current and prior versions of Windows and Mac OS X) and eight different browsers (the current and prior versions of four browsers) and was supported in seven different languages. So, one bug was reported on Firefox v59 on Windows 8.1 in French. The same bug was reported on Safari 6.2 on MacOS 10.8 in English, and so on. Bug reports like this wasted everyone’s time, but that tester sure looked productive in the “Bug Finder of the Month” contest. Financial rewards are almost always a bad idea. Financial rewards are often introduced by a well-meaning boss who wants a team to make a particularly aggressive deadline. The boss will offer an enticing amount to the team if they can deliver by then. So far, so good. However, problems arise on the next project. On that, the team may start on schedule, but they’ve been trained that if they get a little behind (or perhaps even only if they report themselves as a little behind), the boss will offer a bonus. This becomes a dangerous cycle. Besides, financial rewards don’t tap into people’s intrinsic motivations. There’s absolutely nothing wrong with money. Most of us wouldn’t show up for work without at least some paycheck. Still, we’d like to tap into deeper motivations than the purely financial. I learned a lot from a team many years ago to whom I gave a large financial bonus. This was two teams of 12 developers, and I gave them a bonus of $75,000, which would be more than $6,000 per person…if I split the bonus evenly. That was the trouble. I had allocated the bonus in the budget, so I had the money in a pool to give to them. However, when it came time to decide how I would give it to the team, I couldn’t decide. Give the same amount to each person? If I gave each person $6,000, that seemed unfair to those with high salaries and overly generous to others. Give an amount that was proportionate to each person’s salary? This seemed the opposite. Weigh the amounts by how many months the person had been on the project? It seemed unfair to give the same amount of money to a developer who joined the project a month ago as someone who had worked six months on it. Give to the developers who had worked on this project but had been transferred off? It seemed unfair to leave them out, but if they weren’t there during the hardest period, did they deserve as much? I couldn’t decide. I went back and forth on this. Some of the key people on the project knew I was planning this bonus and wrestling with this decision. They offered advice. However, each person’s suggestions were always very aligned with what would reward them the most. I told the team I would give them $75,000 but it was their decision how to allocate the bonus. I told them the issues I’d been struggling with and said that whatever they decided would be fine. However, they had to all agree on the process they’d use and the allocation. A week after I shifted the problem to them, we had a team meeting. They told me they could not find a way to distribute the bonus money. They argued about it. They felt the money was interfering with the strong bonds they’d built as a team. They gave the money back. They decided they didn’t want it. I don’t think I’d ever been more proud of (or surprised by) a team. We ultimately decided to spend some of the money on a nice out-of-town trip for everyone plus a significant other. The rest was returned to the budget. It was the last financial reward I’ve offered a team. How Should We Reward an Agile Team? I think the most important consideration is that rewards should encourage teamwork rather than individual performance. I favor rewards (both incentives and bonuses) that are given to everyone on the team. This doesn’t mean that there’s no role for individual rewards. I think those can be fine, but for individual rewards, I prefer to make them smaller, at least in relation to team rewards. For example, I’ve worked with a few Product Owners who carry five-dollar bills and give them to team members who could quote the project’s elevator statement or three main goals when asked. No team member’s life was improved by $5. It was more the knowledge that they passed the test when asked. More than one of these team members pinned the $5 to their cubicle wall. Similarly, a handwritten note can do wonders in this era of constant email deluge. Take the time to write a note every now and then thanking a team member for something special and specific they did. One of my favorite rewards for a team is time. Time is something that everyone seems constantly short of. I’ve rewarded a team with time a couple of different ways, which have been consistently well-received. For example, you can offer a team an incentive of a week off if they meet some delivery milestone. Or, if a full week off is too much, offer the team a week (or a Sprint) where all work is of their own choosing. They can refactor old code that the Product Owner has been resistant to approving if they choose. They can experiment with new technologies. They can catch up on reading if they want. Whatever they choose is fine. Another option is to give the team knowledge. If they achieve some goal, send everyone to a conference. If appropriate, everyone goes to the same conference. That’s especially good as you can include some fun time before or after. Or, if it’s better, allow each person to pick their own conference to attend sometime during the year. Or, give everyone a book budget (yes, this is a financial reward, but it’s a little different) or a budget for online learning. Perhaps a Safari membership. Even one of my video courses. There are plenty of other options. There is a role for incentives and bonuses on agile teams, but they need to be carefully designed to be consistent with agile’s emphasis on teamwork. Done well, rewarding team members with incentives and bonuses can benefit the team and the organization. How do you reward teams? How would you like to be rewarded as a team? Does Agile Development Need Project Managers?